Hopi Ear Candles are hollow candles made from flax. They are impregnated with pure beeswax and aromatic oils. They originated from American Hopi Indians of Arizona. They are an ancient method that was traditionally used to cleanse and balance conditions of the ear and head. 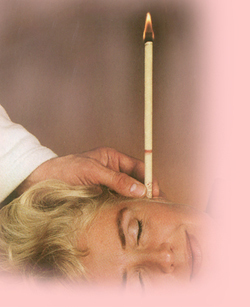 Hopi Ear Candles can help with conditions such as Tinnitus, Sinusitis, Glue Ear, Cold and Flu conditions. The treatment is totally painless. The candles work on a chimney principle drawing impurities to the surface and equalise pressure in the head. Vapour and oil extracts help soothe irritation and increase local circulation and lymphatic drainage. Pressure in the head is instantly relieved. The treatment is very relaxing and can also relieve general stress. Suitable treatment during pregnancy and excellent treatment for pre/post flight.